It’s a pleasure to be guest posting for Lydi Out Loud today. 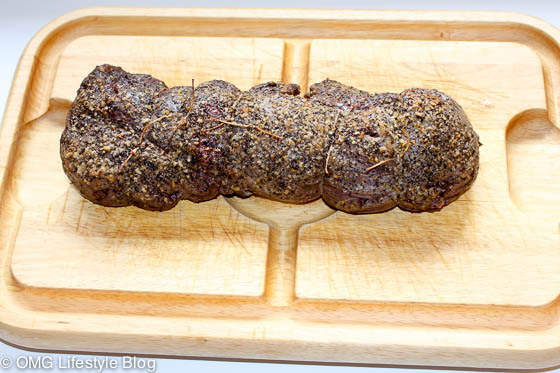 I’m excited to be sharing my Foolproof Beef Tenderloin Recipe. It’s one I have made dozens of times and it truly is foolproof with the help of my favorite kitchen gadget. 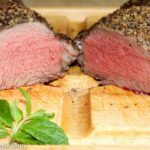 Beef Tenderloin is an ideal entrée for the holidays yet many people shy away from it for fear of not knowing how to prepare it. There is no need to be intimated in preparing such an expensive cut of meat. I have perfected making this delicious roast and am happy to share with you my simple recipe and tip on how to cook it to the desired temperature each and every time. 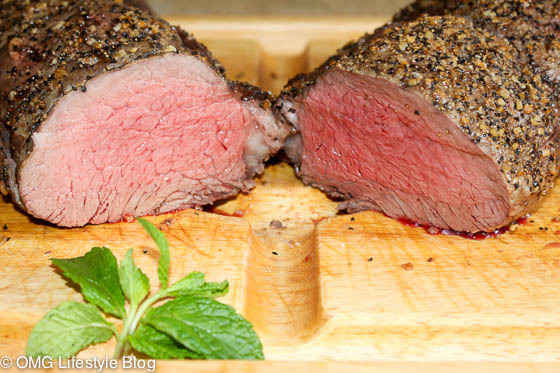 Let the tenderloin sit at room temperature a minimum of 45 minutes before roasting. Pre-heat the oven to 500 degrees 15 minutes prior to roasting. Spray the meat with either canola oil or rub some olive oil over it. You don’t need much. The purpose of this step is to allow the seasoning to stick to the meat. Heavily season the roast with McCormick’s Montreal Steak Seasoning. If you haven’t tried this seasoning, it’s the perfect blend of coarse salt, pepper and garlic. Insert a meat thermometer halfway into the thickest part of the roast. Set the thermometer to your desired temperature. (I cook it until it reaches 125º for medium rare, as shown in the photo). That’s the only prep needed! It doesn’t get any easier! Cook the roast at 500 degrees for the first ten minutes. By starting the roast at a high temperature, it sears the meat. Be sure to set a timer so you don’t forget the next step! After the initial ten minutes, drop the oven temperature to 400 degrees and continue to cook until the thermometer reaches your desired temperature. As mentioned above, our preference is to cook the roast until it reaches 125 degrees which is medium rare. Once the tenderloin has reached your desired temperature, let it sit for a minimum of 15 minutes. Tent it loosely with aluminum foil to keep it warm. It needs to rest so that the juices remain in the meat and not on the cutting board. It’s best to cut the roast on a cutting board that has grooves to collect any juices. For suggestions on accompaniments for the tenderloin as well as garnishing the platter, click here for some great ideas. Beef Tenderloin is the perfect meal for a dinner party as the only last-minute prep you need to do is slice the meat, allowing you and your guests time for cocktails and hors d’oeuvres. What makes this recipe foolproof as I mentioned earlier? 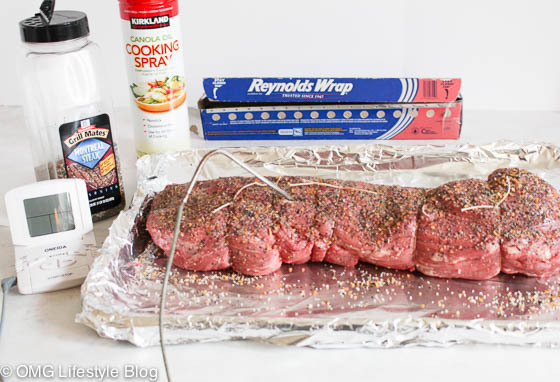 My all in one meat thermometer and timer is the key to the perfect roast! I’d be lost without it. The thermometer has a heat proof probe that you stick in the thickest part of the roast. The cord attached to the probe is long enough to extend outside of the oven where it plugs into the timer. Set the timer to the internal temperature you prefer. Make sure the sound is turned on so that you can hear the alarm. The timer will beep when its time to take it out of the oven. There you have it. 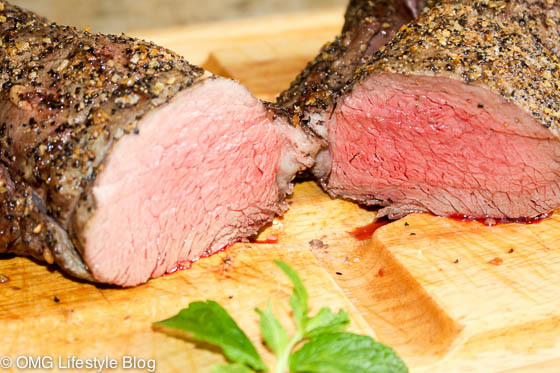 A simple yet delicious recipe for beef tenderloin. Print the recipe here! Spray the meat with either canola oil or rub some olive oil over it. You don't need much. The purpose of this step is to allow the seasoning to stick to the meat. Heavily season the roast with McCormick's Montreal Steak Seasoning. If you haven't tried this seasoning, it's the perfect blend of coarse salt, pepper and garlic. Cook the roast at 500 degrees for the first ten minutes. By starting the roast at a high temperature, it sears the meat. Be sure to set a timer so you don't forget the next step! Once the tenderloin has reached your desired temperature, let it sit for a minimum of 15 minutes. Tent it loosely with aluminum foil to keep it warm. It needs to rest so that the juices remain in the meat and not on the cutting board. It's best to cut the roast on a cutting board that has grooves to collect any juices. I’d love for you to visit my blog, OMG Lifestyle where I share food, fashion, decor and travel inspiration. You can also find me on Pinterest, Facebook, Twitter and Instagram. I look forward to connecting with you. Thank you Lydia for the opportunity to be on your wonderful blog. Happy holidays to all! Made this for Christmas it was delicious and super easy! The meat came out so tender and flavorful! I will add that it should be removed from the oven 5/10* before it reaches the desired internal temperature. It continues to cook while it rests. Yay Beth I’m so glad to hear you liked it! We had it for Christmas, too! 🙂 That’s a great suggestion and very true! Stunning, the guests will be impressed! We want to cook a 5 lb. tenderloin a day before the party, then refrigerate overnight. Next day how long should it be out of frig to bring it to room temp? Hi Betty Jo! It’s hard to say exactly because it all depends on the size of the roast. Because I bring the meat to room temperature before placing in the oven, it cuts down on the cooking time. For a 5 lb. roast, it may take 35-40 minutes, +/- to cook and then add 15 minutes for resting. A meat thermometer is key though and I would start checking internal temperatures after 30 minutes. Oven temperatures vary so much and it’s key to not overcook. I hope that helps! Absolutely simple, delicious and impressive!